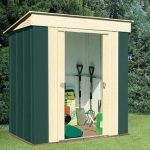 This deep and tall lean to shed is an ideal storage facility for gardens where space is at a premium. We especially like the fact that both the roof and the door can be reversed, meaning that it can be adapted to suit the exact space that you have available. When inside we found it roomy and airy, thanks to the integrated ventilation panels, and there’s even the option to add a sliding window if you want to spend more time inside the shed. 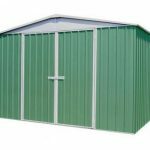 With our increasingly damp climate, weather protection is very important when it comes to metal sheds. That’s another area where we find this shed scores highly. Both the lean to nature, which allows an adjacent wall to provide shelter from rain, and the pent roof help to keep the channel precipitation away, keeping the contents dry. It means you won’t have to worry about unsightly rust, a feature that is also borne out by the lengthy warranty supplied by the manufacturer. Whilst we do think that the assembly instructions could be a little clearer, once assembled it seemed strong and stable, which is another important factor if its going to be sited in areas that are exposed to winds. 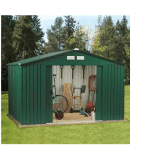 Overall, it’s a good value shed that offers a surprisingly large amount of storage room. 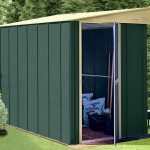 We liked both the look and performance of this lean to metal shed, with the green and off white colour scheme creating a pleasant contrast, and importantly being utilised inside and out. 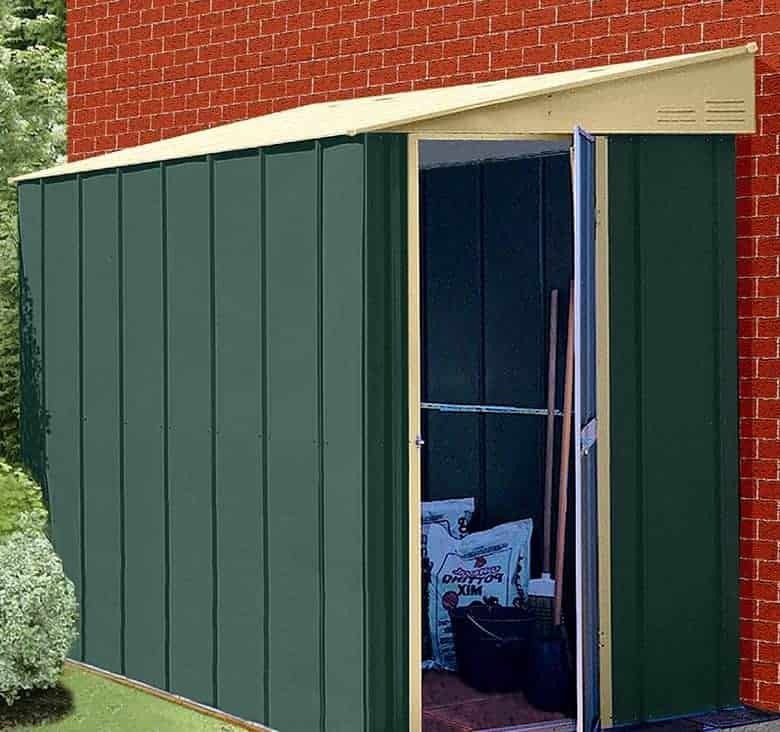 Lean to sheds offer inherent advantages over other sheds, specifically that their weather defences can be significantly improved if they are placed against a wall. 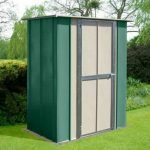 This shed will look just as good, however, if it’s placed in a stand alone position in your garden. One thing that caught our attention immediately was the height of this lean to, with the ridge of the pent roof and the eaves being taller than on many metal sheds we review. At its peak the roof has a height of 1.98m, and the eaves height is 1.78m. The overall depth of the shed is 2.33m with a width of 1.13m, so these also need to be kept in mind when finding a level concrete area on which to instal the shed. At just 0.25mm thick, this is some of the thinnest and lightest cladding that we find on metal sheds, yet we found that the hot dipped galvanisation process had strengthened it to the extent that it felt reassuringly strong and secure when installed and attached to the thicker galvanised frame. The same galvanisation process has been used on the walls, gables, and roof which gives excellent weather protection. We were disappointed that no anchor kit was included, but if a suitable area of level concrete, or a level patio area, already exists then a set of Hilti screws is a low cost extra. Other flooring kits are available as optional purchases if required. The level of protection offered by the combination of galvanised cladding and a rain repelling pent roof is shown by the long warranty offered by the manufacturer against perforations caused by rust. We were delighted to see that this warranty period extended to 20 years, much longer than that we see on many similarly priced sheds, and the owner will be just as delighted to find that no annual treatments are required due to the metal nature of the shed. When reviewing sheds with hinged doors we like to ensure that they are strong and resistant to applied force. We were pleased to find that the braced single door on this shed was tougher than its relatively thin appearance suggested. It was also higher and wider than many single doors, measuring 1.73m and 0.67m respectively. This makes a big difference when walking in and out of the shed, particularly if you’re carrying a heavy load or manoeuvring a wheelbarrow at the time. The standard shed comes with no windows, but it does include ventilation on the gables. We found this made the interior airy and welcoming, and this can be improved further if the option to add a sliding window is taken up. If you’re worried about the possibility of shed break-ins then you’ll want to add a strong padlock when you buy this shed. We would have liked to see one included, but at least the handle is holed ready to accept a padlock. On a more positive security note, if the window free design is kept many opportune thieves will be deterred by the fact that they can’t see if anything valuable is stored inside. We can see advantages to having a window and advantages to not having a window, depending upon whether the owner wants to use the shed as a private and secure storage facility, or whether they want to spend more time inside. We were very pleased, however, to see that this choice is available to the customer to make. A sliding window, featuring tough styrene glazing, can be added to one side of the shed for £50. The other options to consider relate to the flooring. A set of Hilti screws act as an anchor kit if you already have a flat and suitably sized area of concrete. Alternatively a steel foundation kit will help you create a concrete base, or a timber floor kit will create a suitable platform on which to install a wooden floor. Once again, we like the options that the customer is presented with. With galvanised cladding used across the shed the high quality of the components is plain to see, although we would have liked the metal used to be slightly thicker. A 20 year warranty is twice as long as that found on some sheds we review, so you can forget about having to worry about unsightly rust. 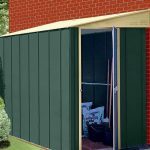 The narrow frontage is helped by the long depth of this shed, and the tall headroom means that you can fit a lot more tools and equipment inside, particularly if optional shelving units are purchased. This shed features a lot of components, and the instructions weren’t the clearest we’ve seen. Read the instructions twice and have the parts and screws set out ready, and you and a friend should be able to install it in around six hours. 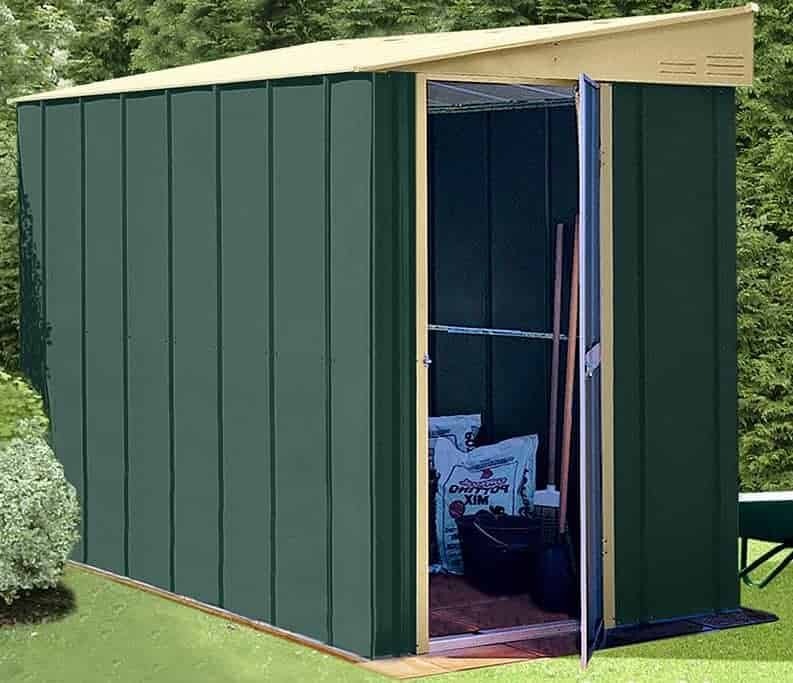 We would have expected a mid sized lean to shed with a long warranty period and attractive finish to cost more than three hundred pounds, so this represents good value for money. 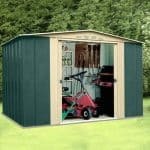 Final Thoughts: If you’re thinking about buying a metal lean to shed, then we certainly recommend that you look at this one. Its tall eaves and doorway made a pleasant change from having to bend down when we enter lean to sheds, and the ventilation system made for a cool and pleasant interior. You can also flood the interior with natural light, if you wish, by adding the inexpensive sliding window option, and it’s also possible to lay a timber floor to make the shed seem even warmer and more inviting. Whether it’s you or your tools or equipment inside you can be sure that the pent roof and galvanised cladding will keep rain away and the contents dry.